There are so many benefits to buying meat locally that it seems a terrible shame to do anything else. Although many people say that they cannot buy meat locally because it is too expensive, this really isn’t the case. Of course, if you go comparing two-for-one deals on battery farmed chickens from the supermarket with the very best organic, free range chicken from your local farm shop, the local meat will be far more expensive. If you take into consideration the superior taste of the local chicken, the treatment of the animal, the sustainability and the ecological impact, there really is no competition. Now, not many families can afford to buy the very best all the time and, even if you can, you don’t have to. If you find out about your local meat suppliers and get your slow cooker or casserole dish out, you can cook cheaper cuts of meat anyway. Then it really is win, win all round – you’re not spending your hard earned cash in the all-powerful mega supermarkets and you’re not spending a fortune in the far shop either. Buying local meat has great environmental benefits. Just imagine the air and road miles of a joint of lamb for roasting. Bizarre as it may sound for a country full of sheep, a lot of the lamb sold in the UK is imported from New Zealand. It is transported to a central distribution centre before being sent to the supermarkets. This isn’t even taking into account the slaughter process (which can often involve live transportation). Compare that to buying a lamb joint from a local butcher that slaughters his own meat. Barely any food miles, especially if you buy it straight from the farm shop. Seeing the enormous profits of the supermarkets going up and up, year after year, when there are so many local shops going out of business cannot be a coincidence. Many local high streets suffer when a major out of town megastore opens in vicinity. By buying locally you support your local economy and help to keep family run businesses commercially viable. When you visit a town where local people are keen to support their shops you get a completely different feeling to those ghost towns were everyone gets in their cars to drive to the supermarket. It doesn’t have to take longer or cost more, either. 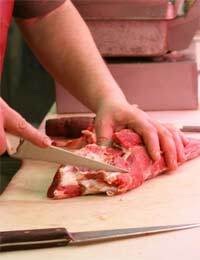 Many butchers now offer a box scheme, local delivery or frozen multi-packs. Once you have tasted it you will not want to go back to meat that has been flown halfway across the world. There really is no competition between supermarket meat and local meat. Not only will it have been handled with care by the butcher but the animal is far more likely to have had a better life, with subsequently more tasty meat to offer you at the end of it. Don’t forget that you do not have to have great towers of meat with every meal. Humans do not need to eat meat every day, so it is a good idea to get used to eating better quality meat less often. For example, a quality roasting joint or chicken from your butchers can give you a few meals for your family when you get used to eating less meat and using leftovers.